I have some of the artist's other works but this site has most of his pieces in one collection and are an inspiration for painting that Transylvanian army that I wrote the lists for and have yet to play myself. The heavy Hussar (1600) pictured above is interesting and is very easy to model with existing 25-28mm figure ranges. The figure has many similarities to the Polish and Muscovite Hussars of the same period and just shows how many of the military techniques and ideas were shared by those living close to each other. There are several other images of heavy hussars from around the 1650's which are very similar apart from the boots and some more plate, so I feel a mix of old and new style figures would look great and not be too out of place? 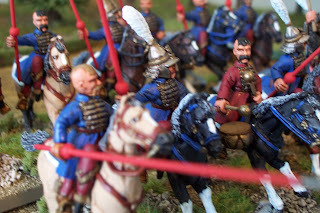 To start with Old Glory has a specific pack in their Eastern Renaissance range which is well detailed but way too small for my liking, then their are the unarmoured Hussars models from Redoubt miniatures which look great and are large (28mm), see my attempt above (painted as Lithuanians). The new Polish Hussars from TAG would also fit the bill and you could use the wing to represent Tartar nobles as pictured trying to captrue Karl X by several contemporary artists. 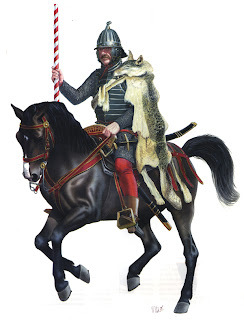 However I am going to use a combination of the new Essex Miniature Polish Hussars without wings to make this unit. They are being painted at the moment as Muscovite heavy hussars but the addition of a seperate flag will enable them to fight in the 1656 Transylvanian invasion of Poland with their Swedish and Cossack allies. sweet blog, very nice minis!!!!!!!! !